We are honored to be a Judy Niemeyer Certified Shop. We have a wide selection of patterns from Quiltworx and the knowledge to help you create a masterpiece! We participate in regular training programs to make sure we can help you with any "Judy" project! Karen Caduff is our resident in-house expert on the patterns and can assist you with color selection. Just call for a personal shopping appointment. Please plan on 1-2 hours to ensure you end up with the best possible product. M, Fri, Sat 10 a.m. - 6 p.m.
Tu, Wed, Th 10 a.m. - 7 p.m. Thanks for visiting Elaine's Quilt Block website where CUSTOMER SERVICE IS OUR NUMBER ONE GOAL! We are a Judy Niemeyer Certified Shop with two AMAZING Certified Instructors that teach a variety of classes, Karen Caduff & Josephine Keasler. We have a beautiful quilt shop located in Cottonwood Heights, Utah, and offer a wide selection high quality quilting fabrics and notions available for all of your quilting needs. Kaffe, Batiks, Brights and Modern are just a few of the types of fabrics in the shop. We specialize in unique projects you won't find in other shops. In 2018, Quiltworx.com designed its fifth “Technique of the Month” pattern. 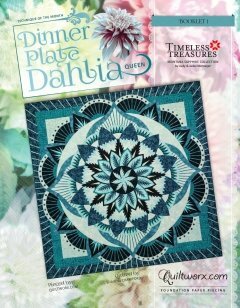 The Dinner Plate Dahlia quilt brings together a wide-range of techniques for Foundation Paper Piecing, leaving students with the ability to move on to many other Quiltworx patterns once they have completed this design. The Dinner Plate Dahlia includes many of Judy’s techniques for paper piecing, including cutting, stacking, chain piecing, curved paper-piecing, smart corners, the use of Transition and Registration Point (TRP) Lines, and our newest technique, curved strip piecing. Join Karen Caduff for our Technique of the Month class. Starts 3rd Saturday in February.